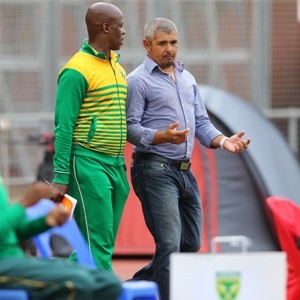 Cape Town - Golden Arrows coach Clinton Larsen has pointed out that there are no clubs currently making a strong claim for the Absa Premiership title. The current top four of Baroka FC, Orlando Pirates, Arrows and Cape Town City, have managed a total of only two wins in their last five matches (a combined 20 games), and only three points separates leaders Baroka from eighth-placed Bloemfontein Celtic. In light of this, Larsen is remaining upbeat of his team's chances despite Arrows' failure to win any of their last seven league matches. Of the seven games there has been one defeat and six draws, the most recent a 2-2 draw with Cape Town City last weekend. "I'm proud of what the boys are doing. To get maximum points in this league is not easy, especially for small clubs like Golden Arrows," Larsen told KickOff. "So I'm very, very proud. There are some games we could've won and we drew but one thing you can never, ever question is the commitment our players show out there. "There's an inconsistency throughout the league - don't just point fingers at Arrows, it's everybody. "Which team is running away with the league right now? You can't tell me there's a team, so we are happy. We are a young team, we are a small team and I'm very proud of what my players have achieved so far," he added. Abafana bes'Thende are next in action when they face Free State Stars at Goble Park on December 6.